Passover is in full swing, and Easter is now just three days away. It’s a festive time that for me brings back many fond memories from my childhood…and ushers in continued traditions that I look forward to each year. Like mock cake, a Polish sweet bread with poppy seed filling that we bake each Christmas and Easter. This Easter is different for us than ones in years past. When we lived in Colorado, we celebrated Easter with our “Colorado family.” It was a wonderful, warm gathering of friends who are as close to us as our blood relatives are. Now that we live in the New York’s Hudson Valley, our Colorado family is far off, but our blood family is in our own backyard. 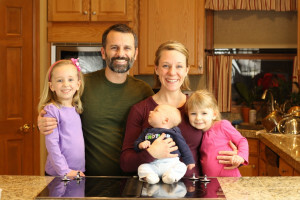 On Sunday, we’ll head to Kelli’s sister and brother-in-law’s house in northern New Jersey. We offered to bring dessert, and they happily accepted. Our plan is to bring fruit tart cupcakes (upon request), but we couldn’t resist the opportunity to make an extra batch of Easter-themed cupcakes. 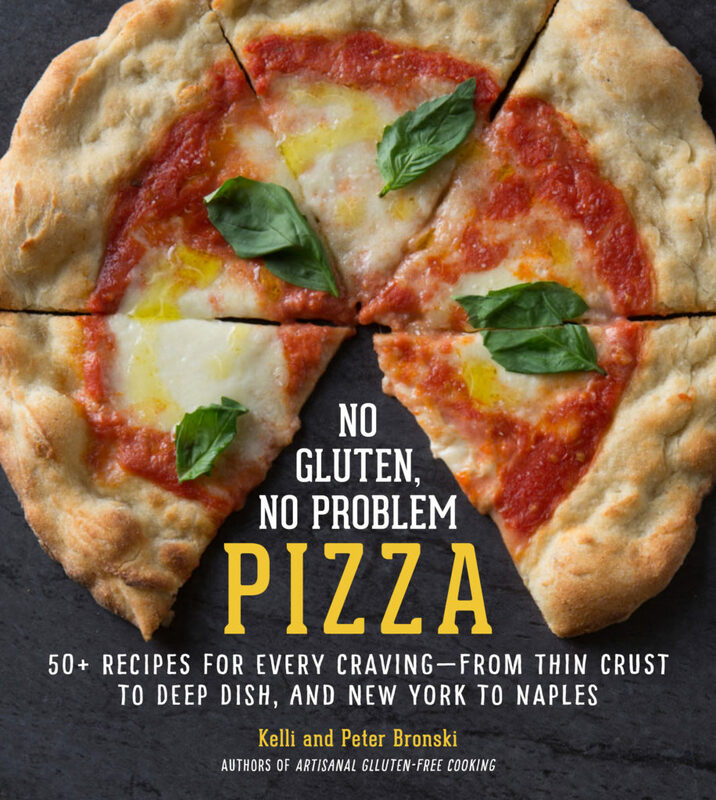 As many of you know, our second cookbook – Artisanal Gluten-Free Cupcakes – comes out in just five weeks! 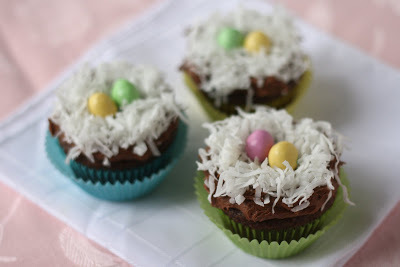 So, we repurposed the chocolate cupcake recipe from the book, paired it with a chocolate American buttercream (powdered sugar frosting) also from the book, and topped it with sweetened flaked coconut and pastel colored candy to create these cute bird’s nest cupcakes. 1. Preheat the oven to 350 deg F. Line a standard cupcake tin with paper liners. 2. Heat the butter, water and cocoa in a saucepan over medium heat until the butter is melted. 3. Meanwhile, put the sugar in a mixing bowl. Add the butter-cocoa mixture and mix at low speed for about 5 minutes, until cool. 4. Add the egg and mix to incorporate. 5. Add the sour cream and vanilla, mix to incorporate, and scrape down the sides of the bowl. 6. In a separate bowl, mix the dry ingredients – the flour through the salt – and whisk to mix. 7. Add the dry ingredients to the mixing bowl and mix for about 10 seconds at medium-low speed to incorporate with the wet ingredients. 8. Scrape down the sides of the bowl and mix for an additional 5 seconds at high speed, just until everything is mixed and smooth. 9. Divide the batter evenly among the paper-lined cups. Make the top of the batter as smooth as you can. 11. Allow the cupcakes to cool in the tin for 10 minutes, then remove from the tins and let cool completely on a wire rack. 12. While the cupcakes are cooling, make the chocolate frosting. 1. Cream together all ingredients except the melted chocolate, until light and fluffy. 2. Mix in the melted chocolate. If the frosting is too thick, mix in additional heavy cream 1 tsp at a time, until the desired consistency is reached. 1. Use a small palette knife (or whatever works) to spread each cupcake with a layer of chocolate frosting. Leave the frosting higher around the edges, so you have a depression in the middle. 2. 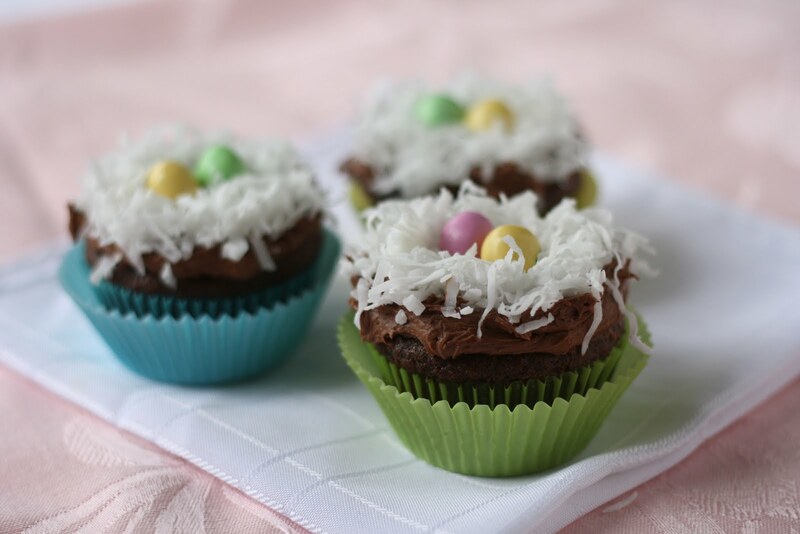 Sprinkle the perimeter of the cupcake with sweetened flaked coconut. 1. To make this recipe egg-free, dairy-free, refined-sugar-free, and/or vegan, follow these recommendations for allergen-free baking. 2. We used pastel-colored peanut M&Ms for our “eggs” in the nests, but you could also use gluten-free jelly beans, chocolate eggs, candied almonds, or any other GF candy of your preference. P.S. In the interest of bloggerly love, we’ve also posted this recipe over at Simply Sugar & Gluten-Free’s Slightly Indulgent Tuesday post. 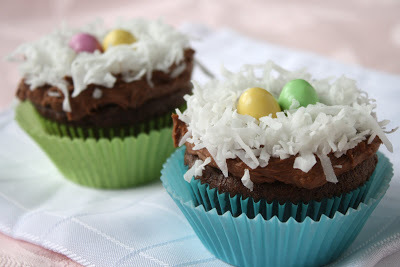 The Easter cupcakes look great, but I was really drawn to your mock cake recipe. My mother’s family is Polish — my mom’s name from home was Glogowski– and we always had what we called Poppy Seed Roll for Christmas and Easter. My daughter has had celiac disease since she was two, so she has never been able to enjoy this traditional treat. But your photo looks very much like the poppy seed roll I remember and that motivates me to want to make it for my daughter. My mom and grandmother also made it with apricot filing, using cooked apricots not apricot jam. We called this one Apricot roll. Whether it was apricot or poppy seed, these rolls could lead to a family fight if there was only one piece left. Thanks for working out what looks like a very good, gluten-free version. Adorable cupcakes and I’m sure they’re “out of this world” delicious! I was so lucky to get a sneak peek of your incredible new cupcakes cookbook. Can’t wait until everyone can see it! 🙂 Have a wonderful Easter with your family! Hi Shirley… Many thanks for your compliments! Hope you had a wonderful holiday. We had a great time… some time with the girls at home, then drove to NJ to see family for the rest of the day. I have made the chocolate cupcakes a couple of times, each time the centers of the cupcakes are hard and don’t have a good taste. The outside of the cupcakes are moist and delicious. I would like to know is there something I can do to fix my mishap. Dear My Yahoo… I’m at a loss as to why the center of your cupcakes would be hard, but the outside would be moist and delicious. Are you following the recipe exactly? Have you made any ingredient substitutions? Please email me (pete@peterbronski.com) with additional information and I can try to help you out.